The Autofil laboratory filtration system is a disposable, sterile, vacuum operated bottle-top filter system used for the preparation of buffers, tissue culture media, microbiological media and other biological fluids. This hands-free filtration system works in conjunction with the Quick-Connect Pedestal or Cradle Ring which provides on/off vacuum flow control. 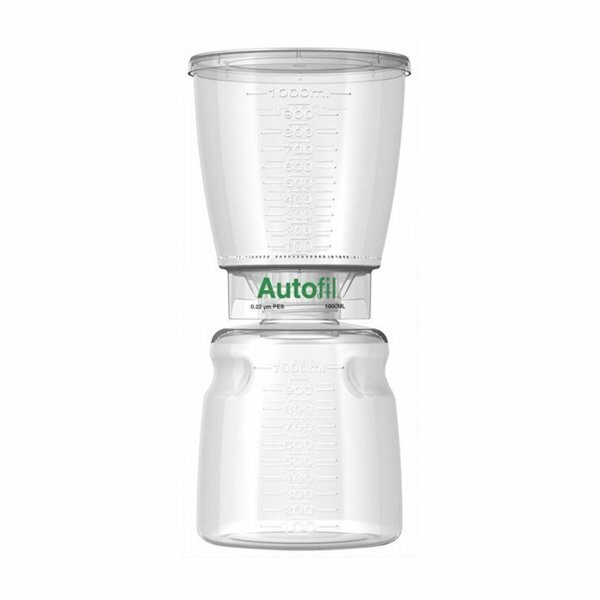 Autofil bottle top filters are available as a complete system or just as the bottle-top filter itself. Both options have an upper filter funnel with dust cap that contains a 0.1μm (mycoplasma filtering grade), 0.2μm (sterilization grade), or 0.45μm (clarification grade) asymmetric PES membrane. The membrane is low protein binding and surfactant free. 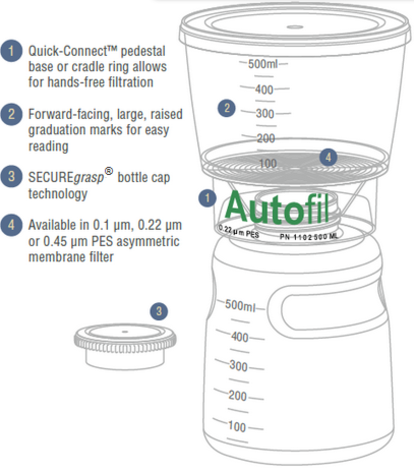 To further discuss the Autofil Bottle Top filter range, and how we can help you. Please contact us, or request a callback at a convenient time to suit you.